Miscellany and My 1st Giveaway! Look what I found in one of my purses today: the missing dresden plate for my African Heart quilt. This post explains how I thought I was done putting together all of the plates - only to count that I had 29 plates. I scrounged together some scraps to make another, not realizing that this little guy was hiding in a bag - probably from a trip to a quilt store when I was trying to find some printed background fabric! I guess I will make a mini quilt or something out of it! Last weekend I found this vintage doll quilt at a yard sale for $2. I am thinking of cutting it up to make another patchwork sleeper. Do you like how I am training my toddler to hold up quilts for me? I also found this cool vintage fabric at another sale for a quarter. I've decided to do a giveaway for the first time on this blog. I made this Birdie Sling quite a while ago and have only used it a few times. I hope it's not too tacky to giveaway something that is not in brand-new, mint condition - but the bags are piling up in this house and I haven't been using it hardly at all. Just leave a comment on this post and I will draw a name this coming weekend. My sewing progress has been slow going lately. I am just tired (probably because of the pregnancy) and we've had lots of gloomy-weather that has made me return to my first loved hobby: reading. It doesn't help that that Mendocino clamshell quilt is driving me nuts and very boring to do....... Hopefully I will snap out of this soon! This top has been done for over a week but between the weather being so rainy and overcast and never having a "helper" to hold to the quilt for a picture- that explains why I am late posting this. We went to the North Billerica commuter rail station to take these pictures yesterday. I am very happy with how the quilt is looking so far but I really can't wait to quilt and bind it! All of the "fans" are fabrics from my stash. I had to buy a whole lot of "That's It Dot" by Michael Miller. When my son saw this quilt coming together, he said, "That's dots and ties." I thought that was pretty clever! I plan to return to Laurena's Longarm Quilting to finish this up ASAP. I finally came up with an idea to do with my small pieces of Jay McCarroll's Habitat fabrics right before I left for Kentucky. I had all summer to do something and I really procrastinated this project. I am usually not so prone to putting things off - but I wasn't really excited about the fabrics and knew if I made something for my home - it wouldn't match anything. So I decided to enlarge one of my most favorite softie patterns: the Peg Bear by Jhoanna Monte Aranez of One Red Robin. This pattern comes in the book One Yard Wonders. Normally, this bear turns out to be about 14" tall, mine is about 32" tall after blowing the pattern up to 200%. I sewed Habitat strips along with various solid pieces together and then quilted them onto fusible fleece. I used fleece, wool felt, embroidery floss, and safety animal eyes (from Joann's) for the face and tummy. The best part of this project was that my son absolutely loves it. This is what he said when I gave it to him, "It's a bear! It's a big bear. It's cute, it's cute. I like it. I love it." And he hasn't really let it out of his sight since. He wasn't happy when I had to take it to the BMQG meeting on Saturday! I am so glad that he likes it because it's awfully big to be kicking around a small apartment. I used over 4 bags of polyester stuffing. For our next swap, our guild is doing a non-blind kitchen goods swap. We were asked to bring our own fabrics to give to our partner and simply tell the other person what we might want. The fabrics I received are from Alice, who brought a selection of delightfully soft Christmas fabrics. Alice is pretty flexible about what I can make her - so that's great! These are the fabrics that I gave my partner. I told her she could do whatever she wanted too. I don't have anything handmade for my kitchen - so this is going to be fun. It didn't take me long to recognize, that yet again - albeit subconsciously - I went for a pallette of red, yellow, and blue! Thanks for everyone's kind congratulations on my baby news. We are excited! Early this week I started and finished my project for the Free Spirit Designer Challenge. I am going to have to reveal it after this Saturday's BMQG meeting. 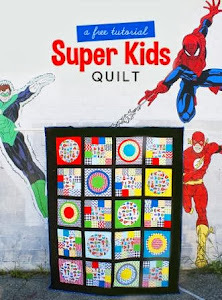 Let's just say that I have made clothing, four quilts, and numerous softiestoys for my son and I have never received such a good reception for something I have made him - it made me very happy (especially considering the thing I made him with the Habitat fabrics is pretty whacky). 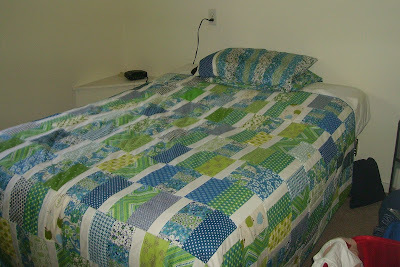 I am still plugging along on my dresden quilt and will have the completed top to show soon. Meanwhile - it was nice to see a picture of the quilt I made my sister in use in her new apartment in Colorado. I gave it to her this spring and I am so happy that she likes it. Most people reading this already know the big news: I am pregnant. The baby is due February 27. I chose not to find out Gregory's gender and plan to do the same thing with this one. It is tempting to find out only because I could really get cracking on making lots of gender specific baby items. But I think it will be worth it to have a surprise. Knowing that our lives will change drastically in about 5-6 months, I have been kicking the sewing time into overdrive. There is just SO much to do! After Gregory was born, I didn't really touch my machine for a good four months- I am only going to be busier with two children! In other exciting news, I am going to attend the Houston Quilt Market at the end of October. 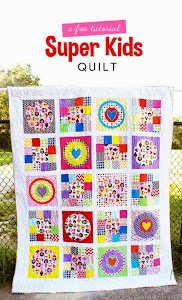 I am assisting with a modern quilting themed book that my amazing friend, Rachel, is authoring. We are still working out what my role is in helping with the book- but I am psyched to have an amazing weekend away with some great friends from the Boston Modern Quilt Guild. You have to have certain credentials to attend Quilt Market - so this was definitely a once in a lifetime opportunity that I couldn't pass up. The night before I left for Louisville, I decided to make some airplane pants for Gregory. I used the Bedtime Story Pajama pattern (Oliver and S) and Anne Kelle's airplane print from "Ready, Set, Go!" Traveling alone with a 23 month lap baby was daunting - but the flights couldn't have gone smoother. I was so happy to reunite with my husband (after a month long absence!) and have a visit with his parents in Louisville, KT. I had hoped to squeeze in a trip to Paducah while we were there - but it is a good 4 hour drive from Louisville and there definitely wasn't enough time! We had a nice time visiting with each other - we went to the downtown Science Center, Nick and I caught a movie (thanks for watching Gregory, Bob and Julie! ), and simply had a nice time allowing grandson and grandparents to have fun together. While I was there, a little bit of quilting was squeezed in: Julie showed me this gorgeous fan/dresden plate quilt that has seen lots of use within the family. I love the design and colors! In the Louisville airport, on our way out, we had some time to kill and were able to admire this crazy quilt from 1875. The strawberries that Gregory is pointing to are three-dimensional. Since we returned on Labor Day, I have been wiped. It's also been raining non-stop and I haven't had a lot of motivation to do much of anything. But yesterday I finally got my act together and started putting the red centers onto the dresden plates - I am over halfway done. I should've inserted this picture earlier, but here is a picture of the fabrics I bought at a Louisville shop. They had a quite the variety of modern and traditional fabrics. I was also shocked by the lack of markup on fabrics - flannel was $10-11 per yard and home dec was about $14. Local quilt shops around Boston sell those types of fabrics for as much as $20 per yard! I used the top left fabric as the inspiration for pulling complementary fabrics (it's Anna Maria Horner Garden Party). The fabric on the far right (Maryoshka dolls) will be the backing. Suggestions for simple quilt patterns are more than welcome!!! !